Minneapolis-St. Paul (sometimes referred to as “MSP”), the largest metropolitan area in Minnesota, is the perfect combination of glittery urbane city life with plentiful outdoor splendor and inhabitants so friendly, they’re known to be “Minnesota nice”. Want to see some world class art? These cities have you covered. More into hiking and kayaking? There’s plenty of awesome hiking trails, resplendent with waterfalls and some of those 10,000 lakes Minnesota is famous for, all within a short drive from the cities’ centers, which may be why Minneapolis is the healthiest city in America. While a visit here may be worth it for the food alone (check out what you should eat here), there are plenty of awesome things, other than the Mall of America, to see and do while you’re in the Twin Cities. This metropolitan area boasts over one hundred microbreweries, ranging from teeny tiny tap rooms to large operations that support national beer-lover favorites, like Surly Brewing. Any visitor mildly interested in beer would be remiss to not check out a couple of the local breweries. Several provide free or low-cost tours of the breweries (some with free samples), like Surly or Insight Brewing, but instead, doesn’t yoga and a beer sound like a much engaging idea? 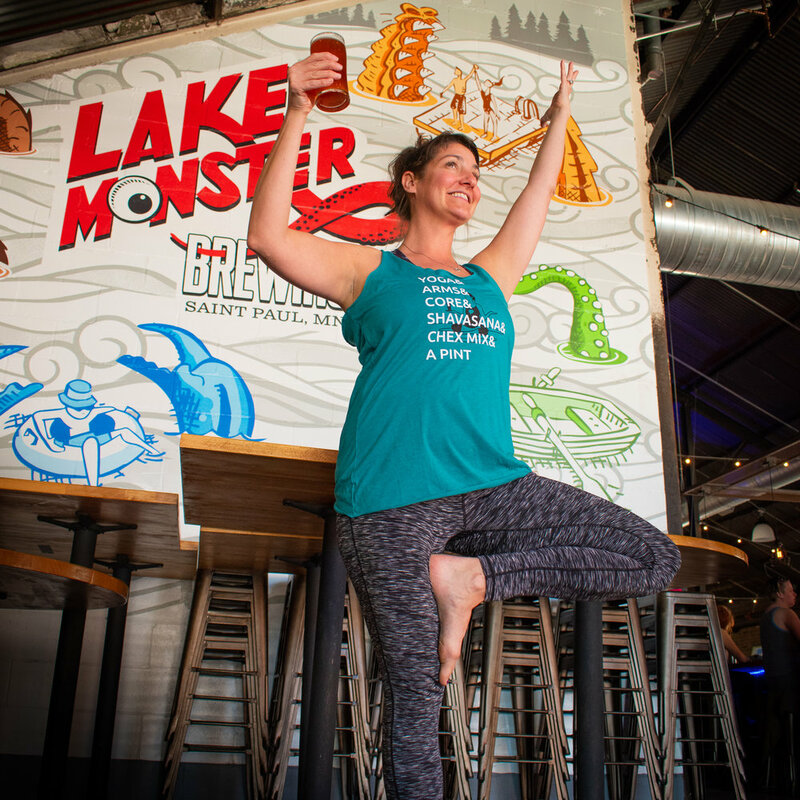 Lake Monster Brewing in St. Paul offers Yoga and a Pint every Saturday and Sunday at 10:30 A.M (located at 550 Vandalia St #160, St Paul, MN 55114; open Monday through Thursday from 3-10 PM; Friday from 2 PM-12 AM; Satuday from 12 PM-12 AM; and Sunday from 12-8 PM). For a whopping $15, you get a playful and music-filled yoga class that will give a rockin’ core and arm workout, a beer of your choosing post-yoga, and all the Chex-Mix your body can handle. To attend, no need to buy tickets beforehand- just show up day of with your mat in hand and ready to downward dog (and/or down a beer). If you want to make an afternoon of it,, Lake Monster has a huge patio perfect for pups and kiddos, where you can munch on food you grab from the food trucks that parks outside every weekend. If you’re feeling slightly active on a Lazy Sunday, this option is absolutely perfect for you. Although it was too cold when we went, there are also some fun kayaking plus brewery combination tours in the area(check out this one)- sounds a little bit dangerous, but 100% delicious! 9700 170th St E, Nerstrand, MN 55053; open 8 AM-10 PM every day. I love a good waterfall and Minnesotas is filthy with ‘em. Out of a plethora of options, we choose to take a hike at Nerstrand- Big Woods State Park, a temperate hardwood forest traversed by Prairie Creek and its many water features about an hour outside of Minneapolis. When you arrive at the park, you’ll pull into a parking lot by the visitor’s center, where you will pay $7 for a daily permit and pick up a map from one of the friendly and enthusiastic rangers. Although the park’s usual springtime highlights (like its one hundred-plus different species of wildflowers or Hidden Falls, the park’s hallmark twenty-foot waterfall) were not in peak condition while we were there due to the freak blizzard that shortly preceded our April visit, the creek and the park’s rolling valleys still make for a lovely outside excursion nonetheless. The scenery was stunning in the blanket of snow and it was fun to prance around in a seeming winter wonderland, while the ambient temperature was actually nearing 70 degrees. Regardless of the season, this park is the perfect playground for the outdoor enthusiast, with snowmobile trails, cross-country skiing, and camping being a few of its many options. As a side note, I wish I had discovered, upon planning our Minneapolis itinerary, that there are places a couple hours north of Minneapolis that occasionally enjoy the Northern lights. Had I known this (and if we weren’t headed to Iceland later this year), I definitely would have planned our trip around maximizing our chances of seeing the aurora borealis (while not completely understood, scientists have said winter is the best time to see the lights in Minnesota). One of the best places to catch them is only an hour north of Minneapolis around the Sherburne National Wildlife Refuge- I probably would have planned a late afternoon day hike in the park and spent the night in the area, keeping my fingers crossed the Earth’s magnetic poles would be working in my favor (here’s a good guide at figuring out your chances of seeing the Northern Lights)! 3745 Nicollet Ave S. Minneapolis, Minn. 55409 and 861 E. Hennepin Ave., Minneapolis, Minn. 55414; open every day from 6 am-10 pm. How have we reached the third item of this list and not discussed options as to where to get caffeinated?! You’re going to be bound to need a strong brew after all the yoga and hiking you’ve been doing. 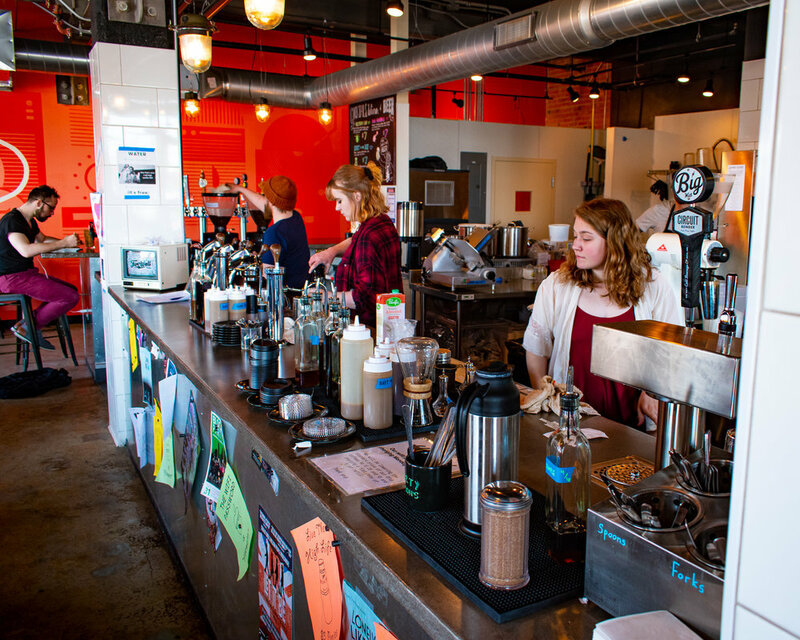 Instead of your basic Starbucks order, you should give Five Watts Coffee a whirl, a shop that roasts its own beans and proudly serves specialty “coffee mocktails”. With coffee drinks created with unique ingredients (like gin bitters and salted lavender syrup) akin to the bougiest cocktail bars, you’d expect Five Watt to have a stuffy, coffee sommelier type vibe. Instead, the shop feels like a friendly, neighborhood hangout, with sleepy-eyed patrons intently working on their laptops; it’s obvious from the shop’s signage and tongue-in-cheek drink-naming scheme (the shop infamously named its autumnal drink a “Venti Starbucks Pumpkin Spice Latte”, with an ingredient list complete with a “pending lawsuit”), it clearly doesn’t take itself too seriously. The warm environment doesn’t mean that the space isn’t impeccably designed, from the snappy logo spanning the shop’s back wall to the industrial feel of the space’s exposed brick and sleek chrome finishes. Upon our visit, I got a Kingfield, made with vanilla, house-made coriander bitters, espresso, coconut milk, and black hawaiian sea salt. Upon first taste, the drink is really sweet, but in conjunction with the acidity of the bitters and espresso (and the tiniest hint of salt), the drink is a perfectly balanced (albeit sugary) pick-me-up. My husband, on the other hand, tried the Big Easy, made with cold-pressed coffee, chicory and nutmeg simple syrup, black walnut bitters, and almond milk- a nutty, earthy drink that made me miss all of the chicory coffee of my trips to New Orleans. Both of our drinks were modified to be vegan-friendly (and almost every drink on the menu was veganizable) and the staff seemed well-acquainted and happy to accommodate our requests. While I honestly did not peruse the food selection, both locations serve pastries, with more hearty options served every day at the Hennepin location and Sunday brunch offerings at the Nicollet Ave. outpost. 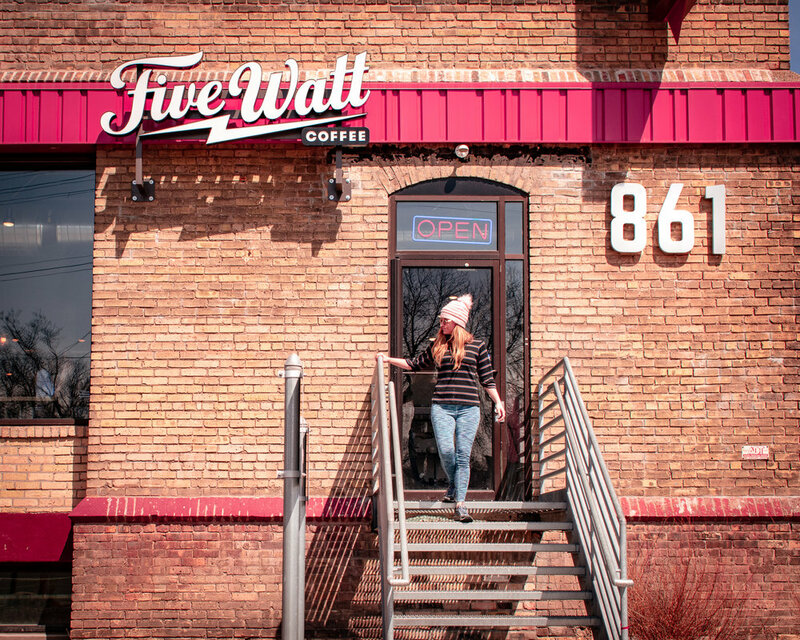 If you’re in need of a place to catch up on some work emails while trying something a bit more adventurous than your corner coffee shop, Five Watts is probably worth a visit. The primary goal of our trip was to see Bon Iver (a band I’ve liked for probably a decade but never gotten a chance to see live) perform entirely original songs, with accompanying choreography from a modern dance troupe. It was hands-down one of the most haunting and beautiful performances I have ever seen and it really should come as no surprise- MSP has a robust performing art scene. Ranked as the fifth most “creatively vital” city in America (after New York, D.C., Boston, and LA), Minneapolis boasts more theater seats per capita than any other American city besides New York. 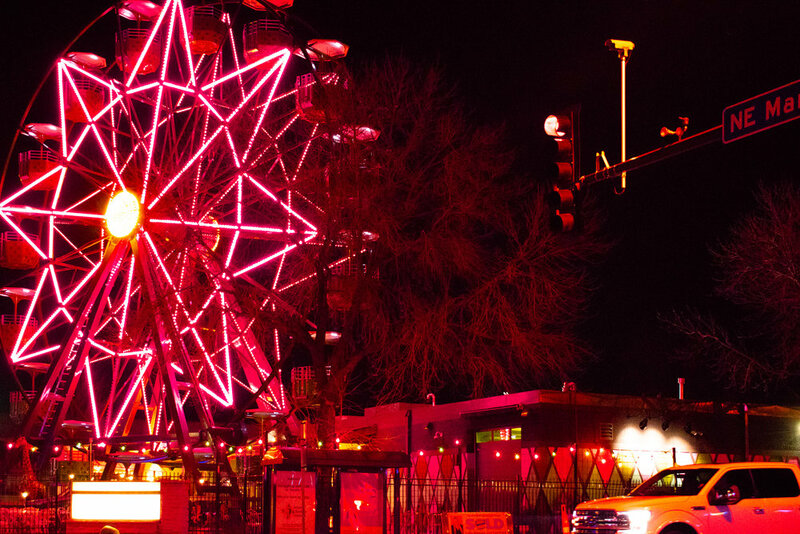 Minneapolis’ Hennepin Avenue hosts an array of shows, from multi-million dollar Broadway productions to gritter performances set in warehouses, allowing a visitor a host of options for nightly entertainment. The Guthrie Theater in the beloved Mill Ruins Park is another popular venue whose schedule you should check out prior to your visit. If music is more your scene, don’t fret- the home to Prince and Bob Dylan has got you covered. Minneapolis’ has almost a cult-like love for the music venue First Avenue, made famous by Prince’s Purple Rain and the Palace Theatre, where we saw Bon Iver perform, has become the preeminent Twin Cities’ venue for national touring acts. No matter whether you are into dance, performance art or some other medium, these cities’ thriving art scene will not leave you disappointed. 1900 Marshall St NE, Minneapolis, MN 55418; Monday-Wednesday from 11-12 AM; Thursday through Friday from 11-1 AM; Saturday from 10-1 AM; and Sunday from 10-12 AM. If you follow this blog, there’ll be a couple patterns that you may notice about our trips. Although we certainly thrive on a diversity of experiences, my husband and I universally enjoy doing yoga in unique places, delicious vegan eats, and perhaps most-of-all, themed bars. 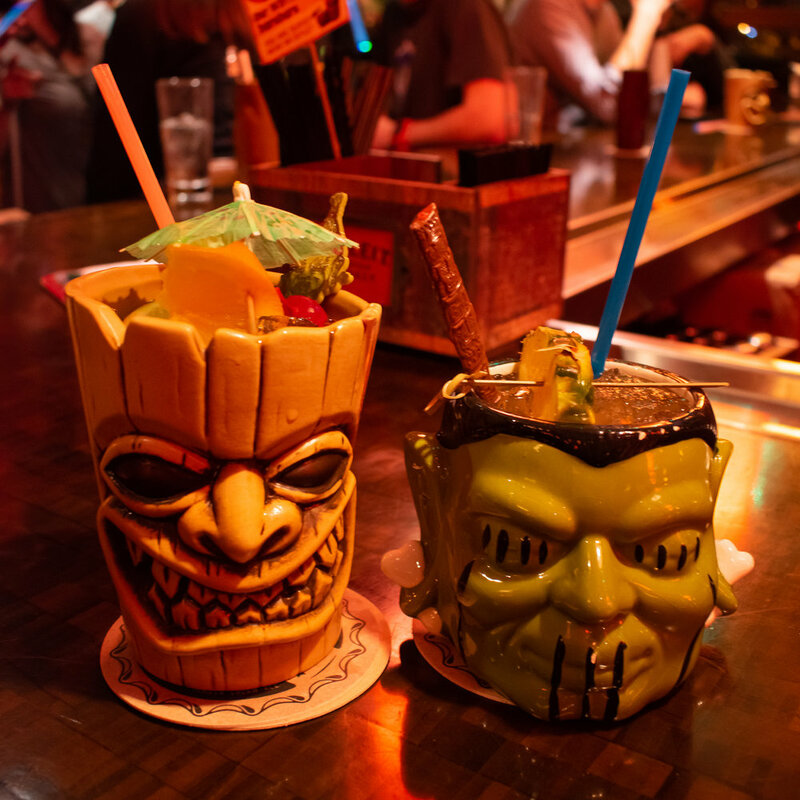 There is no type of theme establishment more ubiquitous or well-loved than the tiki bar, and Minneapolis may have one of the best out there. Psycho Suzi’s is by far the largest tiki bar I’ve ever been to (the building was originally designed to be a church, which is somewhat obvious from its facade), with two floors and three distinct themed bars on the upper floor (unfortunately closed for a private event the night we went). The owner has previously been quoted as describing the bar as a “tiki Taj Mahal” and this feels like a pretty accurate description- the restaurant’s decor boasts built-in waterfalls and carved teak pillars for an overall vibe that simply screams 1960s’ atomic-influenced Hawaiian kitsch. As the food menu is decidedly unfriendly to my plant-based brethren, Justin and I stuck with cocktails (him, a “Psychotic Suzi” and me, the “Cannibal”) and happily sipped our cocktails at the bar. Sweet, nostalgic, and exceedingly strong, they were the perfect nightcap to a busy day exploring the area. Situated on the edge of the Mississippi, Psycho Suzi’s also has the perfect locale for a rocking patio. Complete with thatched umbrellas and tropical flowers, this space, which fits up to 300 people, would be an excellent place to park on a warm summer evening (you can even bring along your pup!). While it was a wee bit too chilly when we visited (although that didn’t stop some of the more hardy locals from hanging out there during our stay), the patio has been voted time and time again as one of Minneapolis’ best patios. Visit the (free!) Marjorie McNeely Conservatory. As a lover of botanical gardens and art deco architecture, I really wanted to check out this beauty built in 1915 on our way back to the airport, but alas, we ran out of time. 4801 S Minnehaha Drive, Minneapolis, MN 55417; 6-12 AM daily. No Minneapolis itinerary would be complete without a stop at Minnehaha Falls, a striking 53-foot oasis in the middle of the city. There are footpaths and benches around the falls for viewing, as well as Sea Salt, an eatery overlooking the falls and its limestone bluffs from the spring through fall, where you can grab a beer and gaze at the falls from the comfort of the patio. This waterfall is located in sprawling 167-acre Minnehaha Park, which offers 10 miles of hiking trails if you don’t want to venture outside the city for your outdoor Minnesotan adventure. 726 Vineland Pl, Minneapolis, MN 55403; open from 6-12 AM daily. At this point, Spoonbridge and Cherry of the Minneapolis Sculpture Garden has gotten to be almost as iconic to Minneapolis as Prince. While the Sculpture Garden itself is fairly small, it is certainly worth stopping to stroll through this park for an hour or two, and better yet, it is free! 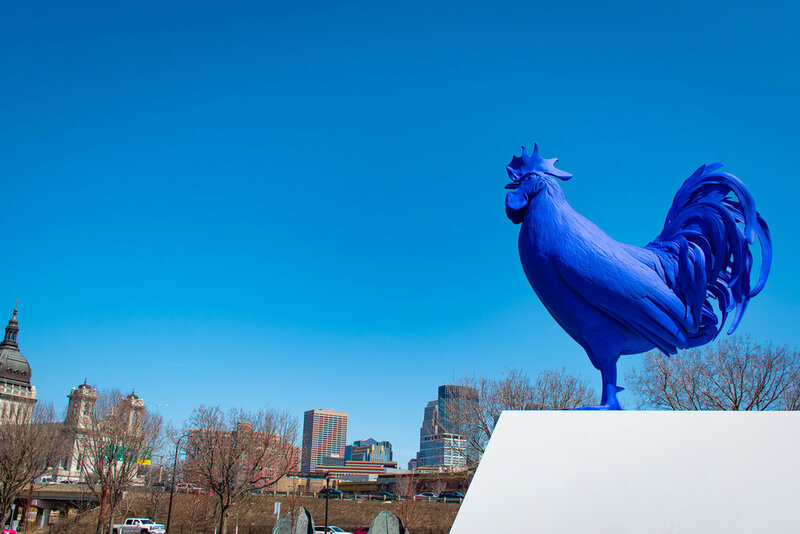 Situated close to Minneapolis’ downtown, the sculptures are playfully incorporated into the city’s skyline. While we visited, there were plenty of locals and tourists alike enjoying the art on a lovely spring day and it would probably be the perfect place to take a picnic. As previously mentioned, the Twin Cities are insanely art-filled, which is evident from its caliber of art museums to the incorporation of sculpture and art into the even the most mundane aspects of the cities’ infrastructure (think sculpture-esque viaduct support beams). When we visited, the forecast originally called for rain and I was planning on hitting up one (or more) of the area’s art museums, either the Walker for contemporary art or the more broad-sweeping collections of the Minneapolis Institute of Art, which may be great options if you visit in the wintertime. 102 Portland Ave S, Minneapolis, MN 55401; open 6 AM-10 PM daily. Along the bank of the Mississippi River, this park, operated in part by the National Park Service, incorporates the ruins of the flour mills and sawmills that once populated both sides of the river. The park’s pedestrian and bike paths snake through burnt-out and crumbling facades of 19th century mills, which are seamlessly integrated with the river landscape and the urban backdrop- if you’re a history buff or just want to know more about the city’s milling history, I’ve heard that the Mill City Museum is worth a visit. I have never visited a park quite like this in my life and I LOVED it; if I lived in Minneapolis, I would absolutely make it a point to jog here on the regular. If you’re looking to woo that special someone or just happen to be a photography nerd, make sure to head to Stone Arch Bridge at sunset for a jaw-dropping display of Minneapolis’ skyline. I can’t wait to get back to the Twin Cities (I hear it’s stunning in the fall!) to check out more of its natural beauty and hidden urban treasures. Do you have any must-see or do recommendations for MSP? I’d love to hear about them below!